John was standing with two of his disciples, and as he watched Jesus walk by, he said, “Behold, the Lamb of God.” The two disciples heard what he said and followed Jesus. Jesus turned and saw them following him and said to them, “What are you looking for?” They said to him, “Rabbi” (which translated means Teacher), “where are you staying?” He said to them, “Come, and you will see.” So they went and saw where he was staying, and they stayed with him that day. It was about four in the afternoon. Andrew, the brother of Simon Peter, was one of the two who heard John and followed Jesus. 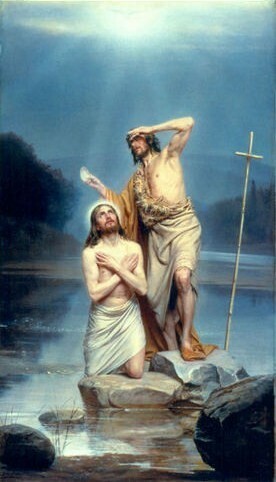 He first found his own brother Simon and told him, “We have found the Messiah,” which is translated Christ. Then he brought him to Jesus. Jesus looked at him and said, “You are Simon the son of John; you will be called Cephas,” which is translated Peter. We traditionally believe the second unnamed disciple following Jesus in these verses to be the author, St. John the Evangelist. St. John describes that these things happened at around four in the afternoon, and he remembers this rather minute detail because of the moment’s importance. The moment is important because this is when he discovered his own purpose—it’s when Jesus entered his life. We each have our own “4 o’clock moments” and they are important because these are moments when Jesus enters our lives. For most of us, it won’t be something radical or seemingly supernatural (though it will be for some.) What is important is for us to give thanks for these moments, to learn how to share them with others, and to remember them in times of trial and desolation. When we are tested and pushed to move away from Christ, let us remember his love, what he offers, and how he has entered our own lives. Today, pray about your own 4 o’clock moment(s). Try to remember not just the greatest moment of connection with God that you’ve had, but the less-impactful ones as well. Give thanks to the Lord for these moments! Compile a list of these moments in a prayer journal, so that the next time you are in desolation, you may look back on this list.